The Lake Worth Lagoon is an estuary that has suffered extensive loss of habitat and degraded water quality due to anthropogenic activities during the past century. Hardened shorelines (e.g., seawalls, bulkheads, etc.) associated with private residences and businesses have replaced approximately 87 percent of the lagoon’s natural shoreline habitats. In addition, stormwater discharges through canals can severely stress the lagoon ecosystem by rapidly changing salinity, increasing turbidity and nutrient loadings leading to eutrophication and degradation of water quality. 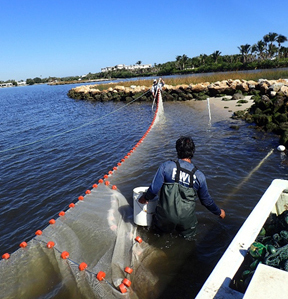 To regain valuable lost estuarine habitats, Palm Beach County Department of Environmental Resources Management have completed many habitat restoration projects in the Lake Worth Lagoon from 2008 to 2013. These projects have restored 14 acres of oyster reef habitat, 5 acres of artificial reef fisheries habitats, 41 acres of mangrove and Spartina, and 11 acres of seagrass. To help determine the success of the restoration efforts, FWRI biologists are developing a Fisheries-Independent Monitoring database that includes quantitative information regarding nekton populations, community structure, water quality parameters and habitat metrics. These data are presently being used to assess the utilization of restored habitats by juvenile and adult nekton at a project site (Grassy Flats restoration) in the central Lake Worth area as the site continues to mature. Before restoration, the substrate at the Grassy Flats site was composed of “muck” that was of limited habitat value to most nekton. Once fully established, the site will support multiple habitat types (mangrove, tidal marsh, tidal flat and oyster reef), which are expected to sustain many species of fish, birds and other biota found within Lake Worth Lagoon.